Two men who made an historic deep sea descent off Bermuda’s Nonsuch Island some 80 years ago were able to lure NBC technicians to the site in order to broadcast live audio footage of their underwater adventure to listeners across the United Kingdom and United States. 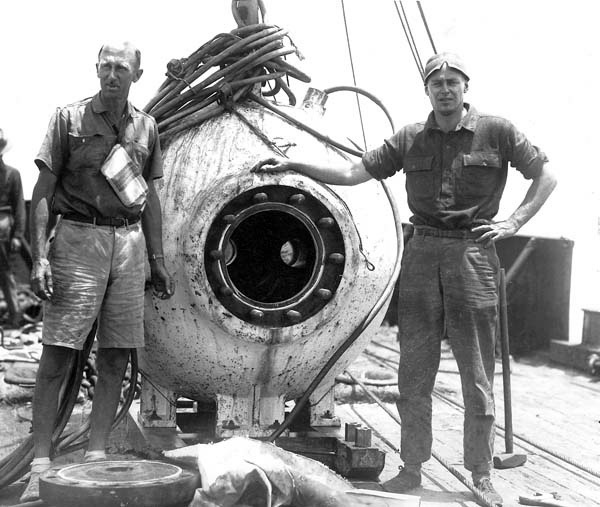 On August 15, 1934, Dr. William Beebe and Otis Barton descended in their bathysphere 3,028 feet beneath the ocean surface off the coast of Bermuda. This was some half a mile deep, and set a depth record that remained unbroken for 15 years. The small vessel was raised and lowered from a ship by a steel cable. Because of the attached cable, the bathysphere could only go straight down and straight back up again, with no pronounced lateral movement possible. Electricity for light and a telephone line were wrapped inside a rubber hose which entered through a small hole at the top of the bathysphere. In Bermuda, the pair made more than numerous dives, with some of them below 525 feet; before Beebe’s and Barton’s dives, 525 feet was the record depth that living explorers had previously attained below water. It was on September 22, 1932, that one of the explorers’ historic bathysphere dives off Nonsuch Island was broadcast by NBC across the United States, with an associated broadcast taking place simultaneously in the United Kingdom thanks to that station’s link with the BBC. The broadcast was divided into two segments, with the divers first enlightening the public as to the preparations that go into such a journey. 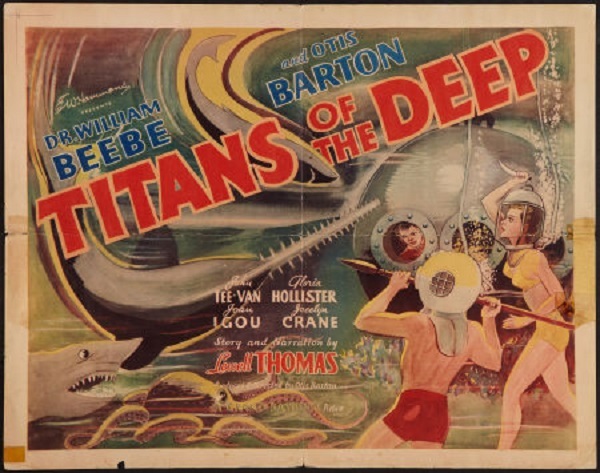 The second segment, though, was the one that truly brought listeners to the aforementioned “new world,” with Dr. Beebe describing the view as the bathysphere sunk further and further beneath the ocean surface. Joseph Cummins’ book “History’s Great Untold Stories: Obscure Events of Lasting Importance” said that at the 595 metre mark during the radio broadcast, the divers experienced a heavy swell. Cummins wrote that at the 670 metre mark, both Beebe and Barton were suffering from severe pressure headaches, causing Beebe to sign off with the words, “Otis Barton and I bid you farewell from a depth of 670 metres beneath the surface of the Atlantic Ocean off Bermuda”. Recounting the trip in his book “Half Mile Down,” Beebe said, “They set up two complete transmitters and two receiving stations on the upper deck of the Freedom. Here they established a special radio station which was called ZFB-i, after the station in St. Georges, which is ZFB. “Through the courtesy of the Imperial and International Communication Company, a license was granted to operate in territorial waters off Bermuda, and its officials cooperated in every way to facilitate the broadcast of this dive. “An elaborate technical set-up of radio gear was required to transmit to listeners throughout the United States and Europe the preparations of the bathysphere on deck and observations made during the dive to 2,200 feet. The engineers considered the problem of transmission from Bermuda to the United States relatively simple. Dr Beebe wrote, “My voice was carried through 3,000 feet of telephone cable from the bathysphere to the deck of the Freedom. “On deck, the voices were picked up from the telephone wires and sent over a portable 50 watt radio transmitter [which had a frequency of 2,390 kilocycles and 125 meters] by short wave to the receiving station at the Flatts. “From there, it was sent over a special telephone cable circuit to the St. Georges radio transmitter, ZFB [10,335 kilocycles, about 30 meters]. “ZFB’s signal was sent over the radio telephone and received at the AT&T Company’s receiving station at Netcong, New Jersey, and then sent over the telephone circuit to the studio of the National Broadcasting Company [NBC] at 711 Fifth Avenue in New York. “From there, it was distributed over the existing networks of telephone circuits of associated long and short wave stations which rebroadcasted the dive over the air for radio listeners from the Atlantic to the Pacific coasts over a combined network of NBC stations, WEAF, and WJZ. Despite covering 71 percent of the Earth’s surface and containing 97 percent of the planet’s water, more than 95 percent of our underwater world remains unexplored. Even so, Bermuda’s waters have often played a significant role in contributing to the five percent that has been studied closely by scientists. Some 30 years after the bathysphere’s historic journey under the sea, four aquanauts spent over a week living underwater off Bermuda in a specially designed capsule. In 1964, SeaLab I was lowered a few miles off the coast of Bermuda, with the experimental underwater habitat developed by the U.S. Navy to research the effects of extended periods spent living and working underwater. On July 22, 1964, four Navy divers – LCDR Robert Thompson, Gunners Mate First Class Lester Anderson, Chief Quartermaster Robert Barth, and Chief Hospital Corpsman Sanders Manning – submerged to a depth of 192 feet, and surfaced early on July 31, 1964. Both Beebe’s bathysphere and the Sealab project have been credited as being important parts of the history of ocean exploration, helping to pave the way for future journeys beneath the surface of the planet’s seas.